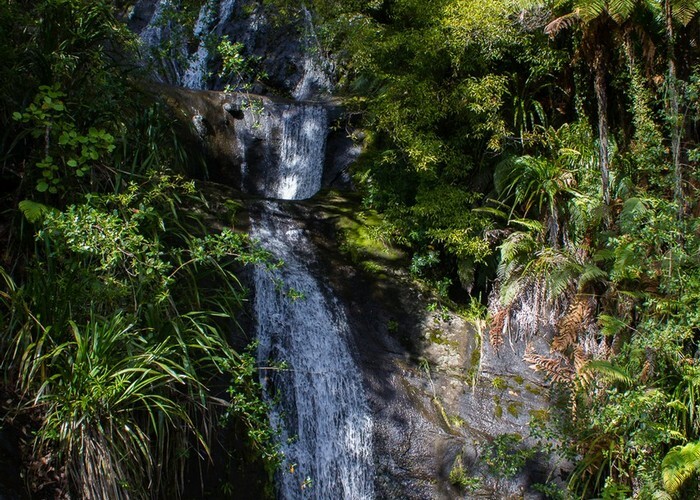 One of the feature walks of the Waitakere Ranges, this track leads easily through kauri forest to the top of the Fairy Falls, then descends a staircase to the base of the falls. The track leads from Scenic Drive through to Mountain Road. Combine it with the Old Coach Road Track or Goodfellow Track to form a loop. 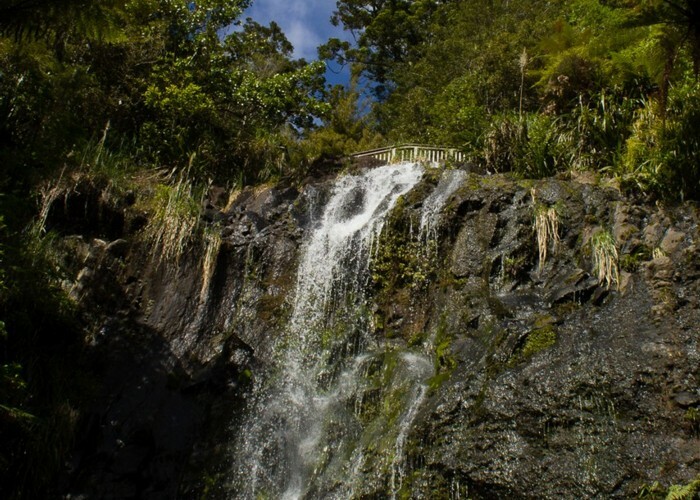 If you simply walk into the falls and back, then Scenic Drive is the best place to start as the car park is bigger and the kauri forest above the falls is worth a visit. From Scenic Drive, the track sets off over the road and passes a toilet. A smooth shingle track leads easily through rimu and rewarewa forest, passing the end of the Goodfellow Track and dropping easily along a and through handsome kauri forest. The track crosses a creek, and takes stairs that wind between kauri trees, alongside 7 or 8 cascades, until the final drop of Fairy Falls. At the bottom of the falls, the track crosses Fairy Falls stream a few times before climbing gently to the Mountain Road car park. Goodfellow Track sidles between Old Coach Road Track and Fairy Falls Track. 30 minutes. Old Coach Road Track, Waitakere Ranges closes the loop, meeting at the Scenic Drive and Mountain Road car parks. Added 28 November 2015 by MatthewMatthew. 2 revisions, most recently 14 September 2017 by MatthewMatthew. 470 views in the past year (39 per month).